There is a lot of confusion about Golden Reinette as there are several old European apples with this name or synonyms derived from the name. Regardless, we do know Golden Reinette was once a very popular apple in North Carolina in the late 1800’s. This old English apple from Herefordshire is thought to be one of the parents of Golden Delicious. 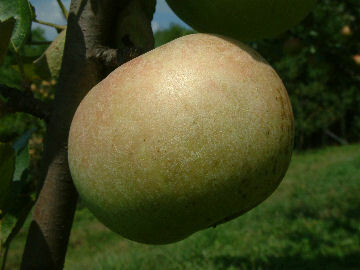 The father of Anderson Mullins, the founder of Golden Delicious in West Virginia, purchased several Golden Reinette trees in the 1880’s to plant in the family orchard. Pollen from these trees crossed with a nearby Grimes Golden, another historic West Virginia treasure, producing a seedling tree which sprung up along a fence row. This tree was purchased by Stark Bro’s Nursery in 1914 and named Golden Delicious. The fruit of Golden Reinette is small and uniform in size with smooth, greenish-yellow skin on the shady and golden yellow on the sunny side. Occasionally there will be a soft dull red blush on the exposed side of the apple. The crisp, yellow flesh is firm and juicy with a pleasant subacid flavor. Ripens late fall and is a good keeper, improving in flavor while in storage. I need a phone number to call you. My wife is from Holand and wants me to get her a golden reinette apple tree. Do have any, whats the price and when do you ship. ?